Bald Head Island has 14 miles of beaches, unspoiled dunes, creeks and forests. 2,000 acres of land are surrounded by 10,000 acres of salt marshes. The centerpiece of island is the Old Baldy Lighthouse, built in 1817, and the oldest lighthouse in North Carolina. The owners have deeded nearby Middle Island and Bluff Island to the state and The Nature Conservancy. 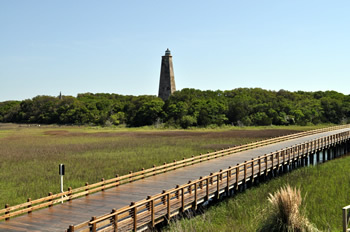 The Bald Head Island Conservancy, a nonprofit organization, was formed to ensure that the unique natural resources of the island are maintained and preserved. UNCW provides students during the summer months to study sea turtle nesting activities. Visitors and Property Owners are transported to the island by the BHI Ferry departing Southport, NC on the hour, or by private boat. Island transportation is by way of golf cart or BHI Trams as there are no automobiles allowed on the island. BHI homes include beach homes, marina homes, condos, shared ownership, and the Bald Head Island Villas. Bald Head Island is home to the BHI Golf Course, BHI Club, and tennis as well. The island is ideal for those who have all necessities in close proximity including several restaurants, golf, grocery stores, clothes stores, boat rentals, tennis, and private club amenities. Lifestyle on the island is second to none. Homeowners and guest enjoy 3 distinct beaches, island watersports, golf, fishing, boating, kayaking/ canoeing, and biking. The developers of Bald Head donated 191 acres to the NC Coastal Reserve. This area is called Bald Head Woods and includes hiking trails thought the island’s maritime forest. Other attractions include Old Baldy Lighthouse, sea turtle walks, kids camp, marina village shops, and deep sea fishing. Life on the Island is a balance between the calm seclusion of the beaches and the easy proximity to the mainland entertainment and recreation.